As I work with the new engine more and more I keep finding new ways it makes life happy and productive. What do you think that code does? It plays a sound, keeps it in memory, and then unloads it when the sound finishes playing (assuming it is not loaded anywhere else). Smart Pointers make the new API almost magical to work with, and they don't have the performance overhead that garbage collection would, and they work great with Lua script. Leadwerks GUI will be used in our new editor, which allows me to innovate in many new ways. 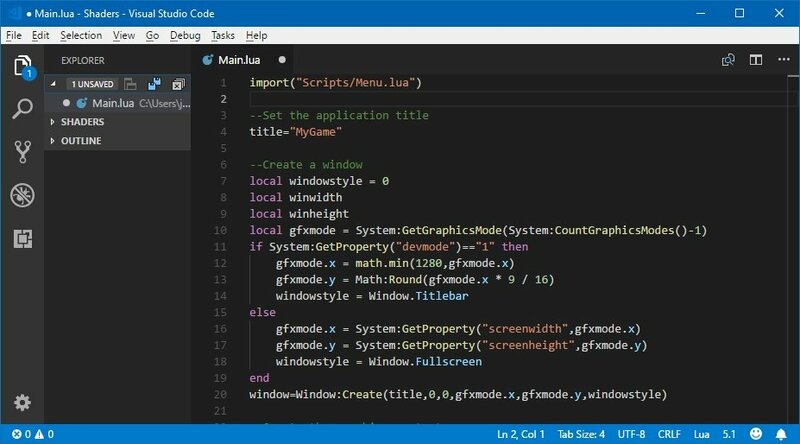 But we're also using Visual Studio Code for the script editor, which gives you a sleek modern scripting environment. Cached shadow maps.are a feature in Leadwerks 4 that separate geometry into static and dynamic shadow-casting types. Static shadows are rendered into a cache texture. When the shadow updates only the dynamic objects are redrawn on top of the saved static cache. This requires that you set the light shadow mode to Dynamic|Static|Buffered. In the new engine this will be automatic. By default lights will use a shadow cache, and if the light moves after the first shadow render, the cache will be disabled. Any geometry can be marked as static in the new editor. Static objects are more optimal for lighting, navigation, and global illumination, and will not respond to movement commands. (This can also be used to mark which brushes should get merged when the scene is loaded). If you don't explicitly select whether an object in the scene should be static or not, the engine will guess. For example, any object with non-zero mass or a script attached to it should not be automatically marked as static. If you didn't understand any of that, don't worry! Just don't do anything, and your scene will already be running efficiently, because the engine makes intelligent choices based on your game's behavior. It's all turning out really nice. Looks like we can do support for Substance procedural materials as well.